A Steam account belonging to an admin of the controversially received survival game Atlas was compromised yesterday, after which point the account thief went on a server-wide rampage that involved spawning countless whales and even tanks. Eventually, the Atlas team stepped in to stop the chaos eventually and perform a rollback on the server. As reported by Rock Paper Shotgun, the person who accessed an Atlas administrator’s account used the opportunity to summon a variety of objects into the game’s North American PvP server. Some of these were objects that would ordinarily have appeared in the game, like a massive swarm of whales. Other objects seemed more out of place, including a cadre of warplanes and tanks. 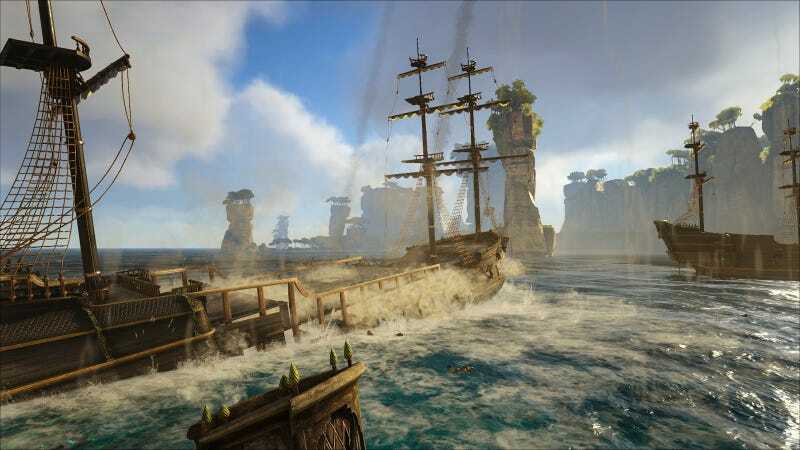 Once other administrators became aware of the matter, Atlas developer Grapeshot Games shut down the server and rolled back progress by about five hours. This prevented lasting damage but also undid any player progress during that time. The chaos is over, but there are still a few clips of airplanes crashing into ships and players battling tanks that serve as a testament to this monumental breach. Even before this incident, Altas has had a rocky launch. It was delayed multiple times and launched to less than stable server status. A combination of laggy infrastructure and the discovery of a menu from ARK: Survival Evolved led many players to decry the game as seeming like a quick asset-flip. Still, this is a game about pirates, so account piracy seems like an almost fitting problem. Hopefully, the admin in question has now changed all of their passwords.